Akane stepped carefully over the gravel, treading lightly on bruised feet that constantly reminded her of the damage they had sustained during her journey. Each step was a test to be passed, and despite her attempts to banish the pain from her thoughts, she found herself wincing with every touch of the stones underfoot. Ranma, for her part, seemed not to share the Tendo girl's difficulty; the silence behind Akane was deafening, Ranma's effortless gliding feeling no less intimidating now than the first time Akane had witnessed it. The cold dampness that clawed at her back only added to her discomfort; combined with the frigid touch of Shoryoutensei against her leg, she was left wondering just why she had decided to leave the comforts of home in the first place. She glanced back over her shoulder at Ranma, and flashed a brief smile when the redhead matched her gaze with an inquisitive look. She looked away quickly, the lingering suspicion that Ranma was about to plunge a knife into her back no less intense. She had been continuously looking back, and judging by the increasingly curious expressions upon Ranma's face, the other girl had begun to wonder why. "Don't worry," came Ranma's voice, "we're not being followed." "Oh, good," Akane replied, relief in her voice. At least her true intentions had not been discovered. They had been walking for two days since the incident at the cave, and barely two dozen words had passed between them in that time. It was not for a lack of trying - Akane had quite often tried to start a conversation, but Ranma had the unnerving habit of staring off into the distance, seemingly deep in thought. When asked, the redhead would always say that she was "just thinking about the past". What that meant, Akane was not sure. She imagined someone over eight hundred years old would have a lot of things to reminisce about, but that did little to ease her mind. There was something unnerving about the way her companion stared off into nothing that she could not quite put her finger on. An endless stream of questions paraded through her mind. Who was that hunter, back in the cave? A clone? Who made the clone? Had Ranma really been alive for eight hundred years? How was that even possible? Akane's thoughts had travelled far as well, although the path her mind walked was little more than a small circle. She swayed back and forth between wondering if Ranma was telling the truth about herself, trying to shake off the image of the Hidari clone's face, and wondering if she would ever find a phone to call her father. She sighed, turning her mind back to the present, back to the aching in her feet. The forest stretched endlessly on, a green sea that blended with the distant horizon. Her initial sense of wonder had long since given away to a dreary ennui, leaving her longing for some sort of change in the landscape, be it a lake, or mountain, or - her greatest hope - some sign of civilisation. She wondered, as she stepped around a tree, if she was heading in the right direction. She had no idea where she was supposed to be going, other than "west". Ranma had not objected to the path she was taking, though, so she could only assume she was on the correct course. Given Ranma's tendency to drift off into reminiscence, however, Akane did not feel at all relaxed about their trip. A small bird fluttered overhead, the sweet melody of its song bringing a smile to her face. Despite it all, she still enjoyed the company of the forest and its wildlife. She knew she would miss it once she had passed through it completely. In many ways, it was a more soothing companion than Ranma. "Where are we going, Ranma?" Silence was Ranma's only response. She sighed, pondering for a moment repeating her question, then decided against it. There was no point in talking to someone who was not listening. The sun burned pale in the evening sky, casting down a faint glow that tinged the sky red. Akane looked up for a moment, watching the pink clouds drift aimlessly above the horizon, and wondered exactly what time it was. "I had hoped we would have had days, weeks - not hours." "What?" Akane asked, startled by Ranma's voice. She turned to look at the stern-faced girl that followed behind her. "I wanted to spend weeks in the cave," Ranma said, scowling, "but those bastards tracked us down faster than I was expecting. They're getting clever." Akane swallowed, the venom in Ranma's voice leaving her ill-at-ease. She watched Ranma's eyes flit back and forth and wondered exactly what the redheaded girl was thinking. "We'll have to adapt if you're going to survive," Ranma continued, more a statement of fact than an observation. "They have our scent now, they will be following us. Damn it all, it wasn't supposed to happen this way." Akane watched Ranma's eyes flit back and forth, a hard edge to them as the small girl seemed to consider her options. "We were lucky there was only one of the clones," Ranma said. "We'll need to accelerate your training if--"
"He ... he smiled at me," Akane interrupted as Ranma mentioned the clone, the preponderance of the Hidari's face in her mind compelling her to recall him. She looked intently at Ranma's face, seeing the black-haired boy reflected there. "He told me he wanted to help me." Ranma's muttering immediately ceased, the redhead fixing Akane with a firm gaze, bright blue eyes demanding attention. "He smiled," Akane repeated, suddenly feeling as if she had said something wrong. "Akane, listen to me. Listen very carefully," Ranma said, clasping Akane's shoulders firmly. "First of all, that wasn't a 'he', that was an 'it'. The Hidari clones don't want to help you. They don't feel sympathy for you, or concern for you, or anything else. They aren't even -capable- of feeling. They just do what they've been told to do, and they've been told to kill you." "Akane!" Ranma snapped, shaking Akane's shoulders. "You have to believe me. It was trying to trick you. You can be sure that it did not have your welfare in mind." "And you do?" Akane asked defiantly, shaking her shoulders free of Ranma's icy grip. She did not appreciate being pushed around by anyone. "What do I have to do to convince you?" Ranma growled, eyes flaring with anger. "I saved you from that ... that ... monster, and all I get in return is distrust and suspicion?" Akane backed away, eyes widening at the heated outburst. Ranma sighed, visibly deflated. "I'm ... sorry, Akane," Ranma said, her hard tone and angry manner melting away into regretful quiescence. "Your safety is all I care about." She reached up and gently cupped Akane's cheek, stroking her calloused thumb over soft skin, and matched Akane's eyes with her own. "I ... I know you still don't trust me. I know you still don't believe me. All I can do is promise that no matter what happens, I will protect you." Akane tensed at the contact, the disconcerting difference in Ranma's mood sending shivers through her skin. She flashed a small, diaphanous smile, pocketing her doubts and fears for later consideration. Nodding her acquiescence, she hoped against hope Ranma would not question her belief - belief that would not stand up to close scrutiny. She needed time to think, to consider Ranma's promises and accusations, to try and place her thoughts into perspective. The safest approach was to play along, equivocate, and hope that things would grow clearer with time. "Thank you, Ranma," she offered, hesitantly. "I ... appreciate that." Ranma smiled, that same charming smile she had shown when Akane had first agreed to accompany her on the journey. Somehow, Akane became acutely aware of Ranma's victory and her own defeat. Once more, she was following the Saotome girl into the unknown. "To survive you must be strong," Ranma said, squeezing Akane's shoulder once again - reassuringly, this time. "You have great strength inside you, but you must awaken it if you're going to stand a chance against the hunters. I'll guard you to the best of my abilities, but that may not be enough." "More training?" Akane guessed, a wavering ambivalence tainting her words. On one hand, she wanted to be strong, to repay the debt of her mother's death. On the other hand, Ranma's lessons and style of teaching were chillingly intimidating. "More training," Ranma confirmed with a nod. "We need to speed things up a little. I'm going to take you to see a man I know. He'll be able to help you." "A man?" Akane asked, her curiosity piqued. Training under somebody else? It would certainly be a distraction from her current worries. "Indeed," Ranma said, looking thoughtful. "He's an old student of mine. In many ways, I suppose, he's a teacher of mine as well." The small log cabin blended in with the wooded hillside, the small trail of smoke that rose from its chimney the one sign that spoiled the camouflage. It protruded squarely from the rolling hills, and yet at the same time did not seem at all out of place. It had a worn, lived-in look, the small patches of dried moss that covered the wooden walls giving the impression that the cabin had been built long ago. "That's it?" Akane asked, peering curiously at the cabin and the small, clear stream that ran alongside it. On one hand, she was vaguely disappointed, having expected something more ... grand, or mysterious. On the other hand, the small wooden house was strangely captivating in its quaint charm. "That's it," Ranma replied, nodding her head. She squinted her eyes, using one hand to shield them from the sunlight. "It looks like he's home. Good." "He who?" Akane asked, peering at Ranma for a moment. "His name is Happosai, and he's your new instructor." The door creaked loudly as it opened, worn hinges complaining as their slumber was interrupted by two intruders. The heavy door swung slowly, coming to a stop only as it thumped against the wall. Akane peered over Ranma's slender shoulder, trying to take in the details of the cabin's interior. A musty smell filled her nose, the collected dust of many years escaping through the gaping doorway. It was a sparsely lit hallway, the dimly flickering light of a fire the only illumination. The cabin sported several windows but all were shaded, leaving the cabin immured in shadow. The house itself seemed faded, worn with age, seeming more like an ancient tomb than a home. A rectangular patch of sunlight, slanted and stretched, intruded upon the darkness, bringing with it the elongated shadows of the two visitors at the door. One shadow turned to the other and spoke. "We go in, of course." A gust of wind blustered through the open door, disturbing the eerie stillness and stirring up dust that swirled down the hallway, gathering in a small pile at the base of the far wall. Ranma stepped in through the doorway and Akane, feeling very much as though she were desecrating sacred ground, followed in turn. The wooden floor leeched what little warmth remained in Akane's feet after several days on the road, sending the echoes of shivers whispering up her calves. She had recently begun to adjust to the endless winter that seemed to sheathe Ranma in its chill, and yet the floor felt cold even to her. Ranma strode silently down the hall, her cloak billowing over the floor, covering it from one side of the hall to the other. Still, there was no sound from her movements, and Akane noted with interest the fact that Ranma's passage, unlike her own, did not disturb the remnants of dust left upon the wooden floor. Akane glanced up from the floor as Ranma spoke and gave a slight nod as she turned and closed the door. The shaft of sunlight that streaked the floor grew thinner as the door hinges once again protested, slimming to a sliver before disappearing entirely. The door closed with a heavy clunk, leaving Akane in the darkness. Turning away from the door, Akane peered down the hallway, keeping perfectly still as she waited for her eyes to adjust. The feeble, reflected light of a fire stuttered through the corridors, bringing the hallway to life with the soft edges of a dozen shadows that danced in step to a silent rhythm. Ranma melted silently into the shadows, the tip of her ponytail a flickering ember that vanished into the night. Akane held still for a moment longer; only as shapes began to emerge from the darkness did she step forward. A table pressed up against the left wall, a frame hung on the right, what appeared to be a grandfather clock - broken, judging by the lack of ticking - at the end of the hall. Despite the darkness, dust and cold, the room felt suddenly much more like a home. Akane followed the voice that echoed back and forth off the wooden walls, turning to follow it toward the right at the end of the hall. The crackling noise grew louder, the light more insistent as she rounded the corner, focused somehow on her as if it were an eye. Ranma stopped in front of a door, waiting for Akane to catch up. As she did, Ranma turned the handle and slowly pushed the door open, letting it fall away from her grasp to swing aside. A small man, silhouetted against the fireplace, sat motionless before them in a simple room of wood and stone. Ranma stepped into the room whilst Akane waited on the threshold, watching closely. "Why, hello there," Happosai answered, not turning from the flames, "Master Saotome." "I'm ... glad you're not dead." "So am I, my dear girl. Who is your friend there?" "That is Akane. She's my ... apprentice." Akane swallowed, taking a step forward as her name was mentioned. She stopped as a small, silhouetted hand raised itself to halt her. "You should turn on the lights," Happosai instructed, "so I can see you." Akane blinked in confusion. Lights? Wasn't the fire already burning? "The switch is by the door," Ranma commented. Akane nodded dumbly, and reached out behind herself, fumbling her fingers up and down the door frame until they stumbled across a small plastic switch protruding from the surface. She flicked the switch and immediately screwed her eyes closed as one by one, bright fluorescent lights flared into being overhead, flooding the room with a sterile glow. Akane forced her eyes open slightly to look at Ranma who was staring at her. She nodded, reaching up to scratch the back of her head. "Yeah. Sorry. Had to get used to it." Ranma nodded, satisfied, and turned back to the old man, who still had not moved from his sitting position. Akane stepped up behind him as well, slowly, her eyes still focusing on the surroundings. "How come you don't use the lights if you have them?" "Same reason I boarded up the windows, my dear Akane. I like the darkness." Happosai turned slowly on the small rug that supported him, his frail old body clearly protesting the motion as angrily as the front door had. He was a withered man, small and weak in appearance, with a wispy moustache that hung like a corpse, loosely attached to the old man's face. His eyes, old and bloodshot, lit up brightly when they caught sight of Akane, however, his face instantly transforming into a picture of youthful exuberance as he looked her up and down. "My, ohh my," he slowly breathed, his eyes wandering, "you certainly are a beautiful one, Akane. Almost as beautiful as my dearest Ranma!" Akane jolted slightly at the old man's words, half out of surprise, half out of confusion. Should she feel complimented? "Please, both of you, sit down." Ranma lowered herself into what appeared to be a sitting position - Akane couldn't really tell beneath that cloak - and Akane followed, putting the old man's "compliment" out of her mind for the moment. "Now, why do you disturb an old man such as myself?" "I need to ask a favour of you, Happosai." "A favour? Of your student? What can I do that you can't?" "You know you're not my student any longer, Happosai," Ranma said with a sigh, "you achieved your mastery many years ago." "I didn't pass all of the tests, Master." "You did, Happosai. I awarded you mastery, and that is all." "But without testing one's speed, one can't truly consider oneself ..." Happosai paused for a moment, an indiscernible moment, and a flash of movement screamed from him toward Ranma, only to be met with another flash when it arrived there. Happosai squirmed, his outstretched hand a tiny distance from the swell of Ranma's breast, his shaking fingers curling slightly, trying desperately to make contact. Ranma's grip was firm, however, and Happosai could not move his hand.
" ... a master," he finished, helplessly. "That was not a test I set you," Ranma stiffly lectured, eyes marked with contempt, "and there would be no reward for passing it." "Sometimes," Happosai said, cradling his hand to his chest as Ranma released it, "passing the test is its own reward, Master." Akane boggled, subconsciously crossing her arms over her chest, as she watched the two - master and student - talk. The discussion continued for a time, mired in memories, reminiscences and remembrances, with little of substance to which she could cling for understanding. "So you want me to train Akane," Happosai said, bringing the discussion both to the present and to Akane's interest. His eyes turned to her and wandered upwards, past her eyes, her forehead, to her hair. "I see you've begun already." "It was ... interrupted," Ranma replied with a wince. "Akane," Happosai spoke, his voice somehow capturing her undivided attention, "please go and wait in the hall. I wish to speak to Ranma alone." "Okay," Akane answered, raising herself to her feet and stepping toward the hallway. She closed the door behind her and blinked, wondering why she had agreed quite so easily. She did not want to re-enter the room, so she made a compromise with herself by pressing her ear quietly to the door. "You ask too much of me," Happosai grumbled, staring at the door as it closed. "I ask you to begin the awakening. You are a better instructor than I, and you always were." "A better learner as well," Happosai opined with a wan smile. "Ranma, I am one-hundred-and-twelve years old. Twice before you have asked me to train those who follow you. I have seen what has happened when I do." "And you have seen what happens when you don't, and the apprentice is unready." "Ranma, I ... she was too powerful for her own good. After the first died, I thought awakening the second would save her, but ... it did not." "I know, Happosai. I know," Ranma replied, a regretful tone to her voice. "I have learned since that day. Just begin the awakening, show her what it means, and I will shape her from there." "I ... can't," Happosai said with a sigh, closing his eyes. "I'm sorry." "Listen to me, Happosai," Ranma said firmly, narrowing her eyes. "The hunters have found her. She watched me kill one of them. They can see her now, and they are following her. If she doesn't begin the awakening soon, she will never stand a chance. Can't you see that?" "She is no different to the others," Happosai stated. "Let her die, hide the next more carefully." "There will BE no next!" Ranma yelled, her eyes flaring with anger. "She is the end. She is different. You saw how she looks - it cannot be a coincidence. If she dies ..."
"She is the last? Her line is a thousand years old," Happosai stammered, disbelief tainting his voice. "There are no more?" "There are none," Ranma confirmed. "I don't have ten years to awaken her. You must begin it, and you must begin it now. It will still take weeks, but that is managable. If the years I spent teaching you are worth anything, Happosai, do this for me." "She will be uncontrollable ...."
"I will control her. I will show her how to use her strength. That, I can teach." "Teach how? You banished your strength after the last. She would crush you." "I ... was given the key to unlock it again. After the last I wanted no more part of this, but Akane is the only chance I have left. I won't let the legacy of a thousand years die without taking this one, final chance. I've taken too many steps on my journey to abandon it at the very end. I can still keep Father's promise." Happosai fell silent, brow furrowed in concentration as he considered Ranma's words. "As ... you wish," he said at length, a sigh on his lips. "I will open Pandora's Box for you." "Perhaps three days. Four, at most." "That is not much time," Happosai said with a frown, his hand absently stroking the top of his head. "I ... will try to have her ready in two." Akane opened the door slowly as she heard her name called, her eyes wide in surprise at the words she had heard. The bright light stung them, but she did not and could not care. Ranma met her look with a stern gaze, the same gaze she had given when she had told Akane of Shoryoutensei. "Ranma," Happosai said, "leave us for a day and a night. Akane, come here to me." Ranma moved wordlessly away from Happosai, drifting like some ethereal wraith past Akane. She gave a slight, almost imperceptible nod as she passed the Tendo girl, but nothing was said. Akane turned and watched her companion leave for the first time in what seemed like forever, then turned back to face her new master. Without realising, she closed the door behind herself. Akane did so, again without realising, and the room was drenched in shadows once more. She stepped toward Happosai and sat behind him, somewhat intimidated but eternally curious. "I have no doubt that you heard every word that was said," Happosai said without a moment's hesitation, "with your ear pressed to the door like that. It was quite a challenge to hide that from Ranma, you know. She does like to keep secrets." "I heard. I heard the part about letting me die, that was quite loud." "That was a test for Ranma." "A test?" Akane asked skeptically. "You must understand," Happosai explained, as he shifted to face her, "Ranma has been your steward for nearly nine hundred years. She has seen your ancestors born and dead countless times. She is protective of you, more so than any other. She's only ever asked me to awaken one other. I suspected it was because she was lazy; perhaps she was. So this time, I checked - but no, it seems this time, she has a valid reason." "Because I am the last." "Yes, you are. You don't have any sisters, do you?" "Strange. You should. And your mother's dead, of course, so there are no more children on the way. I suppose it is strange that it would take nigh on a millennium for such a circumstance to happen." "What circumstance? And how do you know my mother is dead?" Akane asked, the reflected fire in her eyes burning like the curiosity in her heart. "Ranma ... tells me these things," Happosai offered, sounding apologetic. "I'm sorry, I shouldn't have been so blunt. The circumstance I mean is that you are an only child. Throughout your entire family's history, two things have been constant: the children were always girls, and there was always - always - more than one." "Until now," Akane said softly. "What does it mean?" "I don't know why it happened, but it means that you must fulfil your family's legacy, or you must conceive a child to do so." "A ch ... child?" Akane stammered, taken aback. She was still at school, she was sixteen, she was not ready to even begin thinking about being a mother. "I ... uh ...."
"Relax, relax," Happosai said with a smile. "Don't worry about that. You have more pressing concerns - like those who hunt you." "Y ... yeah," Akane agreed, somehow relieved to be talking about the more ordinary topic of her supposedly-imminent death. "One of the hunters came to the cave where we were training." "Looking just like Ranma, I imagine?" "How did you know?" Akane asked, feeling suddenly dwarfed by the diminutive man's seemingly immense knowledge. The reasons why Ranma had brought her here were becoming clear. "I'm well acquainted with the Hidari Project." "Hidari Project?" Akane inquired, the name familiar to her from Ranma's explanation. She had mentioned no "project", however. "Ranma is an immensely powerful creature," Happosai explained, withdrawing a small pipe from beside himself. He held the end of the pipe upside down in the fireplace, letting the tobacco ignite, then withdrew it and took a deep breath of the smoke. "There are those who would like to duplicate that strength. Hidari was a sculptor, famous for his skill. The legend goes that he once saw a woman of such astounding beauty and grace that he sat immediately to make a sculpture of her. So perfect was his copy of her, so imbued with the very essence of his skill and dedication, that it came to life. It is for him that the Project is named." "Trying to make a perfect copy of Ranma?" "Exactly. The project began years ago, when the technology to recreate a living being was in its infancy. The first clones were crude, unintelligent, and unskilled. "Perhaps," Happosai added with a daring smile, "an accurate simulation of Ranma in her youth. Don't tell her I said that." Akane smiled and nodded, grateful for the moment's humour. Her muscles and mind were tense, and any chance to relax, even if but a little, was eagerly seized and utilised. "However, time marches ever on, and with it marches technology," Happosai continued, the moment passed. "With each iteration of the clones, they grow closer and closer to the goal that they seek: Ranma - perfected." "But ... why? Why would they do that? Why spend so long trying to copy Ranma?" "Go and pull the board from that window, Akane," Happosai instructed, indicating a nearby wall. Akane nodded and complied, stepping lightly to the window and pulling the wooden barricade away, surprised to find it unattached in any way. Placing it gently upon the floor, she returned to Happosai's side and sat. Through the window the two could see Ranma, standing beside a cherry blossom tree that marked the edge of a small pond, its perimeter marked by the tree line of the hill that extended up behind it. Ranma was a shadow of black and red, still and unmoving. "Ranma is a weapon," Happosai stated, thin eyes staring through a cloud of cigarette smoke at the girl. "A demon, a being from another realm. No power of this world will stop her. Armies have marched against her, the lives of countless men have fallen before her. The hopes of a hundred causes have failed against her very presence." "A - a demon? I ... Gods .... " Akane stammered, her eyes flung wide as the gates of hell to the demon before her. She had suspected, but never ... "Are you serious? Is this some sort of test?" "She commands and craves anger, hate, death and destruction," Happosai continued. "They are to her as food and water are to you and I. She does not merely -desire- them; she -needs- them. There is nothing upon this Earth that will stop her from having them." "Why do you help her?!" Akane demanded. The duty of all martial artists was to destroy evil, not to aid it! "The hunger she obeys is not her own," Happosai explained. "She was born a human. Her nature is that of good. She tries, with all her heart, to fight off the instincts inside her. She hates what she has become. The cloak of waterskin she wears helps to contain the fire." "Waterskin?" Akane murmured, memories of the Hidari clone flooding to her. The cloak he wore, the names he called her; creatures from beyond this world. Legends, myths, she had thought - was it possible Ranma was one of them? All of them? "The cloak is water imbued with a scale of the Grand Dragon Ryujin. It is water to her fire; it holds her back, hides her from the hunters who follow her. She would not be ... pleasant without it. "Throughout her life, there has been only one thing to which she has held true. She has killed or lost those she cared about, and the only exception has been your family. Come what may, she has always used her strength to protect and guard your ancestors." "What ... what did our family ever do for her to earn that kind of loyalty?" Akane asked timidly, overwhelmed by the sheer gravity of Happosai's implications. "You have ... special meaning to her. All you need know is that she will never betray you. She would pull down the heavens themselves if you asked it of her." "And maybe even if I didn't," Akane said quietly, a solemn edge to her voice. Why slaughter legions to protect one? What was the rationale? What was the point? Outside, Ranma turned and walked a short distance along the edge of the pond, lowering herself to her knees after a few short steps. The back of her head bobbed down, almost disappearing from view, as she looked at her reflection upon the mirrored water. "Tell me - what do you think of her now?" "I ... think that she must be evil," Akane answered honestly, unable to hide the truth. In spite of the kindnesses Ranma had shown her, in spite of the friendship and the company, after Happosai's words she could not fathom Ranma being anything other than evil, a destroyer of lives. "Why is that?" Happosai asked, leaning one hand on one knee as he took a long, slow drag from his pipe. "Because she kills?" Akane nodded silently, her eyes fixed upon the shape of Ranma outside. A gust of wind howled past the cabin, sending Ranma's hair and cloak billowing back and forth in the wind. "Then you are making a mistake," Happosai said gravely, turning his eyes to Akane. "Ranma is an angel of death, yes, a devourer of souls, but that is her purpose. She is Grand Dragon Ryukyu the Red, Lord of Fire and Death, given flesh, form, and purpose. She brings fire to the world, and death to those who are destined for it. Life is meaningless without death, and so Ryukyu is a necessary part of the balance." "A ... a ... a dragon?" Akane sputtered, head whirling to face the old man who sat beside her. A demon was far-fetched enough, but a dragon? She had studied mythology at school, dragons were a race of a higher plane of existence, the providers of the earth and the elements. How could one be standing in the grass behind the cabin? "You have GOT to be kidding me." "Oh, things would be much simpler if I was, my dear," Happosai commented with a wry smile. "No, what I'm telling you is the truth." "A dragon ...." Akane repeated, a disbelieving chuckle coming to her voice. How absurd it seemed. She had been travelling all this time with a member of an ancient race. The first friend she had ever had who wasn't intimidated by her, and why? Because she was a dragon. It was almost - almost - comical. Barely a few weeks ago she was concerned solely with a gymnastics competition, a sprained shoulder, and the results of the mathematics test she had taken. Now, she was confronting a wizened old martial arts master about her friend the dragon. How surreal could one person's life become? "Do you intend to attack me?" Happosai asked, snapping Akane out of her thoughts. Happsai gestured toward her hand; she glanced down, and blinked in surprise as she realised she was firmly gripping Shoryoutensei's handle. She had almost forgotten about the sword, and certainly had not thought about using it. "I ... no," she said hesitantly, holding the sword for a moment longer before releasing the handle. "Sorry." "I think," she said quietly, capturing Happosai's attention. "I think I need to lie down." "Before you do, I would like to put a question to you," Happosai said with a shake of his head, laying one hand gently upon Akane's knee. "What is that?" Akane asked in a resigned tone, long having accepted this to be the day for discussion. After what she had heard so far today, she felt nothing could shock her. She did not imagine she would get much sleep, however, with so many suggested facts to digest. "What?" Akane asked, puzzled by the non sequitur. "I ... uh ... two." "Yuka," Akane stated, "and Sayuri." "Why are they your friends?" "Because," Akane began, her voice running out of steam as she puzzled over Happosai's seemingly simple question. Why -did- Yuka and Sayuri like her? Did they even like her? They merely associated with her because unlike the majority of students they were not intimidated by her. "Because they aren't afraid of me." "Eighty or so years ago, Akane, when I first met Ranma, I asked her the very same questions. She said she had no friends but me, because I wasn't afraid of her. You are more like her than you think." "Like her? A dragon? A killer?" Akane asked, bewildered, as she stared at the old man. How could she be anything like Ranma? "You've always felt different to the other people you've known. You've been stronger, faster, quicker to adapt. You've had the ability to crush those who stand against you. Until Ranma. Ranma shows up, full of mystery and secrets, a girl who you cannot defeat, who offers you no assurances, and yet you immediately trust her and follow her into the forest, leaving behind the safety of your home. Why did you trust her?" "I ..." Akane began, sifting through her memories to track down the exact reason she had told herself to believe Ranma and follow her. It came to her only moments later: her mother. It had all been about vengeance for her mother. "She said she would help me to avenge my mother's death." "So you set out to find the cause of a parent's death, joining a quest you did not know or understand, following Ranma because of a bond you felt with her, a kinship, if you will." "I ... suppose," Akane admitted cautiously, her tone guarded. Where was this going? "Tell me, Akane - have you ever, ever, felt a bond with anyone that was as strong or as deep as the one you felt that day with Ranma?" "I don't," Akane began, the denial trying to immediately escape her mouth, to fling itself forward before she could think. She stopped it in its tracks and forced herself to think back, to gloss over her life and remember the moment, the person she met who had given her that same feeling, but no matter how hard she tried, she could not. "No. Never." "Interesting, isn't it?" Happosai asked, raising a withered eyebrow. "That you would feel so connected to a complete stranger, when in your entire life you have never really managed to connect with anyone?" Akane chewed on her lower lip, pondering the old man's words. It was true that she had felt an instant affinity for the girl. In some ways, it felt like more. She had shrugged it off as curiosity at the time, but what if it was indeed more? "I would like to show you something," Happosai spoke, interrupting her thoughts. "Watch this carefully." Akane nodded. Happosai, seeing her nod, stood and walked to a cabinet that rested against the nearest wall. Opening it, he peered inside, searching back and forth with one hand until he found what he was looking for. With a sound of satisfaction, he pulled the object out of the cabinet. "This," he said, holding up a small dagger, "is an ornamental dagger. It's something of an heirloom in my family. My father gave it to me when he died; he was given the blade by his father before him. I don't know how old it is, but I do know it is very sharp." The old man sat slowly, grunting at the effort of folding his legs under himself, and let out a satisfied sigh as he sank back into place. He placed one hand flat on the ground, raised the dagger above his head, and with a glance at Akane, swung the weapon toward his outstretched fingers. Akane gasped, instinctively squinting her eyes closed, knowing what was about to happen. The cry she expected did not come, however; what did come was a sharp pain, followed by a milky warmness, in her right hand. She opened her eyes slowly, and let out another gasp as the sight of her bloodied hand tightly gripping the dual-edged blade filled her eyes. Droplets of blood dribbled out of her clenched fist, splattering onto the ground below. Astonished, she turned her wide eyes to Happosai, who was smiling at her. "Strange, don't you think?" Happosai asked, his grip on the blade unwavering. "The strongest instinct for a human being is self-preservation. Once you dig beneath the pride, honour, cowardice and every other emotion, at the core of it all, is a desire to live and stay alive. It is a trait common amongst almost all living creatures." Akane slowly drew her hand back from the dagger, her fingers shaking slightly as she looked down at her blood-coated skin. The cut was long and narrow, and blood streamed from it at an alarming rate. "However, it is an instinct you don't seem to share," Happosai continued, watching Akane as she examined her wound. "No, it seems that you would rather suffer an injury yourself than watch me, a person you barely know, injure myself. Unusual behaviour indeed. Why did you do it?" "I ...." Akane began, glancing back to Happosai for a moment as she tried to choose her words. No words would come, however, and she found herself staring at the old man in silence. Happosai gave her a comforting smile, and gently placed his hand upon hers. "It is very unusual behaviour - for a human. But, that does not explain your situation." "What?" Akane asked, blinking in confusion as she looked down at Happosai's withered hand upon her own. "The fact is, Akane, I wouldn't have told you this if you didn't need to know," Happosai said slowly, carefully choosing his words. He took a deep breath of his pipe, deflating in stature as he exhaled the smoke, seemingly drained. "You ... must know what Ranma is so you can understand her, because you are kin to her. You feel a bond with her because she is the only other of your kind on this Earth. She is not human, and neither are you." Akane's eyes widened even further, her breath caught in her throat, as Happosai turned her injured hand so the palm side faced up. The bleeding had stopped entirely, and the wound seemed to stitch itself closed before her eyes. "You," Happosai continued, seeing the Tendo girl's utterly blank stare, "are Grand Dragon Ryujin the Blue, Lady of Light, Life and Water, the sworn enemy of Ryukyu the Red." "How is it going?" Ranma asked, her voice echoing over the rippling surface of the pond. A small group of cherry blossoms tumbled down from the tree near the pond, their forms scattering across the turbulent surface. "We tread a dangerous path here," Happosai spoke softly, from behind Ranma. "I've spent the better part of a millenium treading dangerous paths," Ranma commented off-handedly. "Sometimes, it's best to stay on the path you know." "I have told her of you, and of herself. We have discussed her heritage at length. She is resting," Happosai said quietly, turning away as he heard Ranma sigh. "So she will hate me when she wakes up, just like all of the others," Ranma noted morosely, eyes staring deep into the depths of the pond. "When they awaken all they remember is Ryukyu, the enemy of themselves, the taker of life, destroyer of their creations." "I don't know," Happosai argued. "I think you might be right. She -is- like Kayoko. Perhaps she shares Kayoko's ... unique viewpoint." "I hope you're right," Ranma said with a sigh. "I don't think I could cope with seeing her face filled with anger and hate." "She is strong," Happosai added with a shake of his head. "Ryujin's duty will not consume her. She will diminish, but she will remain Akane." "Your attitude has changed," Ranma observed, turning her head to look at the old man over her shoulder. "You said she would be uncontrollable." "She will be. You must grip her firmly, Ranma. Once the awakening begins, she will need an iron hand to keep her in line. It is vital that you teach her control." "The world is not ready for a rampant Lady Ryujin," Ranma agreed solemnly. "If I had any choice in the matter I would not force her to wake. Even now, I regret it. It should occur naturally." "So, why take this unnecessary risk?" "Because it IS necessary," Ranma replied. "Better for Lady Ryujin to consume the world than for Phoenix to consume her. You know that as well as I." "You're biased," Happosai said with a smile. "You want her for reasons that are entirely personal, and you know it." "Be quiet, Tatsujin," Ranma replied with a savage smirk. "I shall accept no cheek from you." "Apologies, Master," Happosai said with a bow, his eyes betraying his mirth. "I just hope your judgement is not clouded too badly by her appearance." "You know what I mean," Happosai spoke more seriously, the weight of his voice indicating the gravity of his thoughts. "The resemblance is uncanny. It can't be a coincidence." "You're right," Ranma replied, stirring the crystalline surface of the pond with a fingertip. The water misted at her touch, leaving behind a trail of frosted white where it passed. "To look at her is to look eight hundred years into the past. It's beyond uncanny - it's exact, an absolute likeness." "You tell me, Tatsujin scholar. You're the expert on dragons." "I wish I knew," Happosai admitted with a shrug. "I find it troubling that she should look so similar. Don't you?" "In a way," Ranma replied, tilting her head as she examined her own reflection. Too many scars. "But it is good to see her again. I've missed her, all these centuries." "She is not Kayoko," Happosai spoke firmly, turning to place his hand on Ranma's shoulder. "It would do you well to remember that." "I know, I know," Ranma replied irritably, waving Happosai's hand off with her own. "I can still daydream, can't I?" "Even after eight hundred years, you're still a teenager," Happosai said, a note of disbelief in his voice. "I suggest you put such hormonal thoughts out of your mind, for Akane's sake as well as your own." "Even after a hundred years, you still act like my father," Ranma countered, turning to give Happosai a smile. "Don't worry. I know my place." 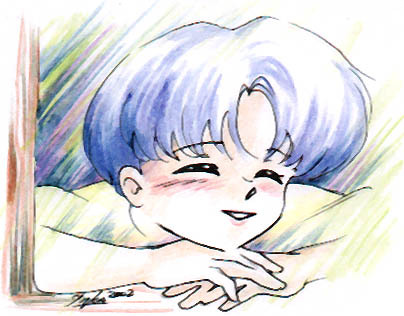 "It will be good to see her again," Happosai offered, matching Ranma's smile with one of his own. He turned and headed into the cabin, leaving Ranma alone with her thoughts. It was not such a bad thing to allow the Lord of Death a taste of happiness once in a while, after all. As soon as she opened her eyes, the voices began. Akane groaned softly as her eyes fluttered open, the thin light of an evening sky peeking in through a small window set high upon the wall. It was a quiet, peaceful evening, the songs of birds wafting through the twilight, the calling of crickets providing a rhythm. A thousand voices crowded into Akane's head, the endless din of every living creature around her calling out its own song, a song only she could hear. She sat up with a start, looking around timidly for the sources of the voices, but nothing presented itself. Her own voice echoed loudly through the room, and for a moment, all was silent. The birds no longer sang, the crickets no longer chirped. It lasted but a moment, though, before the din began again. Scrambling to her feet, Akane rushed over toward the window and, standing on tiptoes, peered through it. She gasped, wide-eyed, as the sight of the pond and the forest filled her eyes. The entire forest was aglow; not with a natural light, but the light of a thousand souls, contained within the leaves, the trees, the birds and the grass. Every living thing called out to her, the chaotic din giving way to a melodious harmony that coated her ears like honey. A smile crossed her face as she stared at the dance of nature, the tiny patterns of life that she had never noticed before emerging before her in the movements of the leaves amongst the branches, the curling of the waves upon the pond surface, the rustling of the grass and the tiny birds that hovered busily between the flowers. "Beautiful ... so beautiful ...."
Face pressed up against the cold glass, she stared until her eyes burned, the glass steamed from her breath, and her toes ached from the strain. It was not enough to look. She had to touch the forest. "What on Earth is she doing, Happosai?" "That is a good question," Happosai replied, stroking his chin. His eyes followed Akane as she crawled through the grass, delight on her face as she tenderly stroked a single blade with her hand, curling her fingers around the tip and smiling enormously. "What happened before I came outside?" "She came out a few minutes ago and has been doing that ever since," Ranma explained, indicating the path Akane had taken from the cabin to the patch of grass with one hand. "She didn't seem to notice me at all. She just ran over there and started ... doing that." "I've never seen anything like it before," Happosai stated, taking a step toward Akane. He crouched, leaning forward to look more closely. "Akane?" Akane continued as she was, embracing the earth for a time before suddenly scrambling toward the pond. She crawled to the water's edge, wild eyes looking back and forth before settling upon her reflection. Slowly, gingerly, she reached out toward the surface, jumping back as her fingers made contact with the cool water. She clutched her hand to her chest for a moment, looking at it with concern for a moment before the newly-created ripples seized her attention. "Interesting," Happosai murmured thoughtfully, watching Akane carefully. "It's as if she's not aware of us at all." "What did you do to her?" Ranma asked, her tone becoming increasingly concerned. Never had she seen anything like this; she didn't like being taken off-guard. "I think I have awakened the dragon." "What?" Ranma exclaimed, whirling upon Happosai. "So soon? That's not possible!" "It certainly seems to be possible," Happosai mused. Akane interrupted their conversation with a burst of loud giggling as she splashed water back and forth with her hand. She lowered her head, sinking her chin into the mud that lined the pond's edge. "Look at her," Ranma barked, gesturing pointedly toward Akane. "You've driven her mad! She's acting like a child, not a dragon. How can you say you've awakened her?" "I can feel Lady Ryujin's presence," Happosai commented. Akane looked up as the words left his mouth, looked left and right for a brief moment, then returned her attention to the pond. "The dragon has awoken." "She knows her name," Ranma observed, her attention immediately captivated by Akane's response. She knelt alongside Happosai, an intently curious expression capturing her face. "She seems to be connected to the water, and she was drawn to the living forest," Happosai added, raising himself to his feet as he hummed contempatively. "Traits of Ryujin." "It's never happened like this before." "I can hardly sense Akane at all," Happosai said, closing his eyes, his brow furrowed in concentration. "It is as though she is asleep. I think ... I think she is dreaming." "So she will wake up from this?" Ranma asked, gesturing towards Akane as the Tendo girl continued to play with the pond water. "I think so. I can't say for sure, but I think so." "It's beautiful!" Akane cried suddenly, her piercing voice making Happosai jump. The old man looked at Ranma for a moment, before the pair turned their eyes toward Akane. "Akane?" Ranma asked, stepping toward the girl. "Can you hear me?" "I can see them," Akane whispered, her voice flowing dreamily from her mouth. "So beautiful. So beautiful." "Can you hear me, Akane?" Ranma repeated, reaching over toward the raven-haired girl, stopping only when Happosai gripped her shoulder. "Leave her be," he instructed, shaking his head. "I think she is beginning to wake from the dream." "So what do we do now?" Ranma asked, pulling her arm away from Akane. "I suppose we wait," Happosai suggested. "There isn't much else we can do." "You know our time is short, Tatsujin," Ranma noted, turning back toward the cabin, folding her arms thoughtfully. "We don't have time for this." "I know," Happosai said with a sigh, the sound of Akane's delighted laughter ringing in the air. "Until she regains her senses, we have no choice." "So beautiful," Akane cried through her laughter, a broad smile spreading across her face. "Can you see the souls, Ryukyu?" Ranma spun in place, her eyes wide. "Lady Ryujin?" Akane raised her head and looked directly at Ranma, flashing him a smile that lasted but a moment, before turning her attention once more to the pond. Ranma called her name again, but Akane did not respond. "Perhaps we won't have to wait long after all," Happosai suggested. "Come, let's go inside and leave her alone." "She is asleep now," Happosai spoke quietly, keeping his voice low as he stepped into the cabin's main room once again. Ranma sat by the fire, looking concerned. "She spoke again before she slept. Her mind is recovering - she is making remarkable progress." "I don't like this. This is too fast," Ranma said with a frown, as she stared into the flames. "Much too fast. This was a mistake." Images of Akane laying in the grass outside - staring up at the sky in utter amazement, her attention completely captivated by a flock of birds flying overhead - filled Ranma's mind. "You said I should hurry," Happosai countered, carefully sitting down alongside Ranma. "That said, even I didn't know it would progress this quickly. She seems to have a natural predisposition towards dragonhood." "There are years of mental and physical preperation required for the dragon to awaken. The body and the mind must be prepared. No 'natural predisposition' will change that." "Perhaps, perhaps not," Happosai opined, taking a long breath from his pipe. "Time will tell one way or the other. All we can do is support her." "I thought we would begin the awakening today, not complete it. This was a mistake. Those Phoenix bastards have forced my hand, and look what has happened as a result. It wasn't supposed to happen this way." "It isn't necessarily a bad thing. Look on the bright side of things," Happosai said, knowing when it was wise to change the subject, "she doesn't seem to hate you. That can only make things easier." "That's good, at least," Ranma said with a snort. "I'm glad to hear at least some positive news after the disaster this afternoon." "You shouldn't be so upset about her behaviour," Happosai said with a sigh, reaching into the fire with his pipe to reignite it. "Such eccentricity is ... to be expected. She has had a lot to deal with." "She was rolling in the grass like some sort of animal," Ranma muttered, shaking her head. "Such 'eccentricity' is -not- to be expected. She must be focused if she is going to avoid the hunters." "That is why you must protect her until she is ready," Happosai said, turning to look at Ranma. "Whether or not she had awakened fully, she would still need protection." "I don't know if I can protect her. This could not have escaped the notice of Phoenix," Ranma commented, her gaze buried deep in the burning embers of the fire. "They are coming, and there will be too many for me to hold back." "I know," Happosai conceded, resting his chin heavily on his hands. "I know. But we've pushed her down this path, there is no turning back now." "This was a mistake," Ranma said softly, watching as the flames consumed a twig, curling it into ashes. "I should not have come here. I've signalled Phoenix by awakening her, and what have I gained? An insane dragon-child." "I've never seen a student quite like her before. She absorbed everything I said as if it were obvious. Perhaps she knows more than she realises. Just because we haven't seen this reaction before, doesn't necessarily mean that it is a bad thing." "You have wisdom beyond your years, Happosai," Ranma said with a heavy sigh. "Why do you spoil it with such youthful optimism?" Akane rolled over in her sleep, moaning softly to herself as beads of sweat trickled down her forehead. The streak of blue in her hair had blossomed in the evening hours, growing into a cluster of blue tendrils that stretched the length of her hair. "I would feel better about this if she didn't take it so lightly," Ranma whispered from the doorway, watching Akane through the darkness. "A person in her situation shouldn't be laughing." 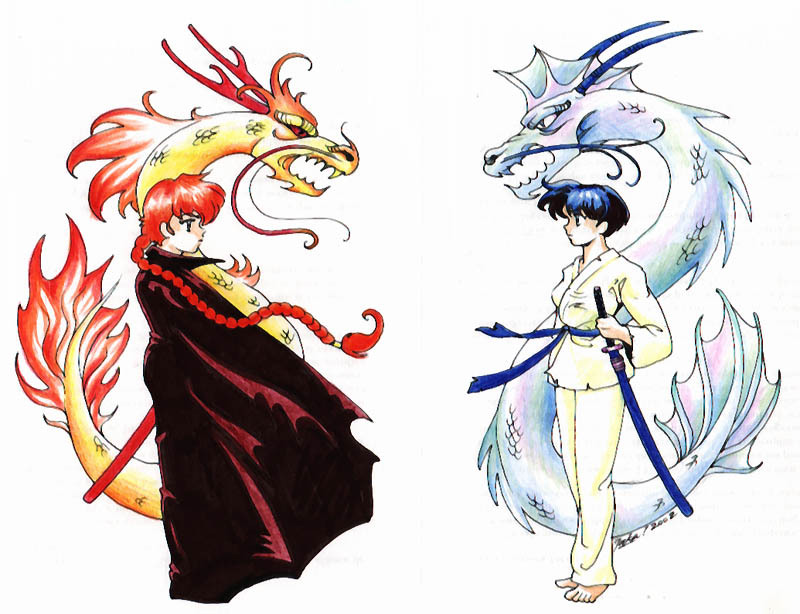 "Ryujin ... she isn't you, Ranma," Happosai spoke slowly, choosing his words carefully. "Her domain contains light and laughter. Compared to you, she will never be as ..."
"Grumpy?" Ranma offered, turning to give Happosai a dangerous glare. "Is that the word you were looking for?" "As a matter of fact, that was exactly the word I was looking for," Happosai said with a defiant smile. "Kayoko called me 'grumpy' as well, you know," Ranma recalled, narrowing her eyes. "My 'grumpiness' is what has kept her family alive for a thousand years. Akane would be an ornamental statue upon the nether realm if not for it. It is a trait she should learn." "She will learn, she will absorb, and she will excel in every field that is important to her," Happosai observed, eyes following the tiny wrinkles in Akane's furrowed brow. "She is not your pet or your plaything. Don't try to force her; let her grow on her own." "I tend to be right quite often," Happosai contended with a smile, hoping to lighten the mood. The frown on Ranma's face told him in no uncertain terms that such tricks would not work. "She acts ... she acts like a child, toying with powers she doesn't understand," Ranma said with contempt, watching Akane roll back and forth atop the futon. "What kind of dragon lowers herself to the ground like a common animal? The Mother of Life with her face in the dirt. It was disgraceful." "Ahhh, the truth at last," Happosai commented, a smile of recognition crossing his face. "You don't want her rubbing your Kayoko's face in the mud. I knew there had to be a reason for all this anger." "That's ridiculous, I'm just saying--"
"I know exactly what you are saying, Ranma. You should not be thinking such things about her." Ranma sighed, her shoulders slumping. Happosai's words rang true. "She makes my beloved act like an infant," she lamented. "Kayoko would turn in her grave if she saw how Akane acts, wearing her face." "That is irrelevant," Happosai said firmly. "Your place is to protect her, not to judge her. She's been given a wonderful gift; at least give her a moment to comprehend it before you start crowding her thoughts with duties and responsibilities." "Gifts always come with a price," Ranma muttered, bristling. She turned and left the room. Happosai sighed, and with a lingering glance at Akane, followed his Lord. "I should have listened to you," Ranma said, her eyes upon the smouldering remains that glowed in the fireplace. "You've never listened to me, Ranma," Happosai observed, smiling for a moment. "You've always made the right decisions on your own. Eventually." "Not this time," Ranma replied with a shake of her head. "She was not ready. We pushed her; too hard, too quickly. I'm afraid we may have broken her mind." "Have faith," Happosai admonished. "Give her a chance. She will sleep, she will dream, and her mind will recover. Don't be so quick to write off her chances. You are letting your feelings for Kayoko cloud your vision." "Perhaps I am," Ranma admitted with a sigh. "Akane worries me. I've seen many an awakening, and none of them have been like this. There is something different about this girl." "She is not the dragon that Kayoko was," Happosai admitted. "But that's not to say she couldn't be. Perhaps being different from the others is a good thing." "One way or the other, I don't think the situation is as bad as you imagine. Ryujin may have awakened, but she is still dreaming. I imagine today has been as much a shock for her as for Akane. Tomorrow will be the day her dream ends and she truly wakes." "You seem confident," Ranma observed, turning to look at the old man. "Do you know something I don't?" "You forget, Ranma," Happosai said, a glimmer in his eye as he rose to his feet. "I know a lot about dragons." "Forgive me if I don't share your optimism. Today has not yielded what I had hoped it would." Happosai stood in silence for a moment, watching Ranma carefully. After a time, he sighed, deciding that enough was enough. "I don't know about you, but I'm going to get some sleep," he said with a yawn. "I would suggest you do the same. Tomorrow is going to be a busy day for all of us." "Have it your way," Happosai replied, waving his hand dismissively. "I'll see you both in the morning. Remember, you must have faith in Akane. She will need your support." "All right," Ranma said with a nod. She pursed her lips, staring into the fireplace for a moment longer before turning her gaze to the old man. "Happosai?" "You didn't have to do any of this. Thank you." A gust of wind washed over the log cabin, sending the leaves of the surrounding trees waving back and forth. From within the sea of motion, a solitary figure crouched motionless, a silent observer upon one of the many branches. "So, she still lives. Forgive me, Mother." Ukyo sank slowly into a sitting position, her eyes remaining on the cabin. There would be no honour in striking while Ranma slept. Revenge could wait until tomorrow.